The Dominican Republic opened in its new embassy in Beijing this weekend following its decision to no longer recognize Taiwan as an independent country. Chinese Foreign Minister Wang Yi and Dominican President Danilo Medina were present at the opening ceremony on Saturday to mark the increasingly close relations between the two countries, facilitated by the island nation choosing to break diplomatic ties with Taiwan in May in exchange for a $3 billion investment and a generous loan package. The move has received substantial criticism. An editorial in the Dominican newspaper El Nacional accused the government of signing a host of secret agreements in exchange for investment without fully informing the public as to their potential consequences. “Politicians, legislators, business leaders and civil society demand transparency in the signing of these agreements and call on the President to explain the real scope of these commitments, some of which advance objections without knowing their content yet,” the editorial reads. “This single declaration by the President compromises the independence and sovereignty of the foreign policy of the Dominican Republic,” wrote journalist Vinicio Castillo Semán. “The Dominican Republic is a sovereign State and can not, therefore, in one of the fundamental attributions as an organized State, sign an agreement by which it has to ‘consult politically’ with any foreign power what is or will be its actions in multilateral forums,” he continued. China has expanded its attempts to influence Latin America, where it uses economic and financial power to forge predatory relationships with some of the continent’s most impoverished nations. 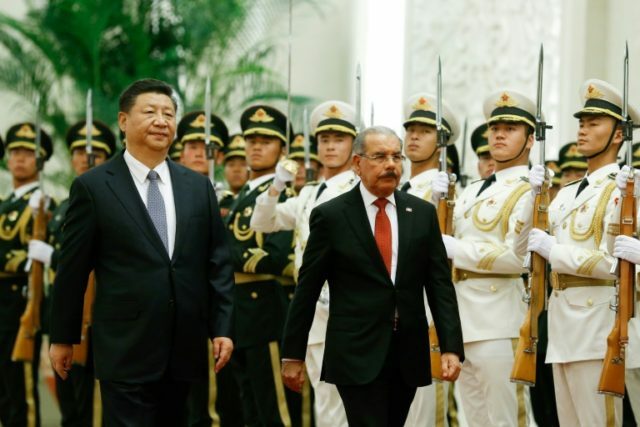 Last week, Chinese Communist Party leader Xi Jinping also welcomed Salvadorian President Salvador Sánchez Ceren to Beijing with a military ceremony at the Great Hall of the People after El Salvador announced they would switch their allegiance from Taiwan to China this year.